If you’ve lost your mobile, you’re not alone. On average, people lose their smartphone at least once per year. Smartphone theft in 2013 was at a record 3 million. So don’t blame yourself if you’ve lost your mobile, there are more constructive and effective actions to take. 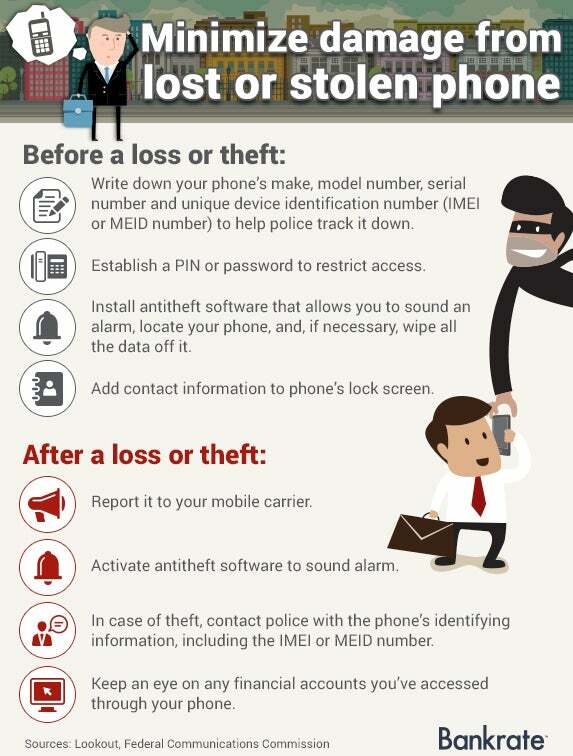 It’s a fact: whether it’s stolen or simply misplaced, you will lose your mobile at some point or another. But being prepared can help ease the pain! There’s some excellent technology out there that you can easily download onto your smartphone that will help you locate it when it goes missing. How it works: Once you’ve installed the Manager, and you’ve got access to the Internet, this easy tool can track your Android device if it’s connected to your Google account. Not only can it track your smartphone, but it can completely wipe it – so your pictures and personal details can be cleared. One of the best features is that you can use someone else’s Android device to track your lost phone by signing into your Google account in guest mode. In the worst case scenario, the person that took your phone might disconnect it from the Internet so it can’t be tracked. But even then, they are likely to re-connect it, so keep trying until it works. Yet another great tool for Android users. Again, your smartphone has to be connected with your Google account, and it needs access to the Internet. The only bummer is that you can’t be running Android 3 or higher – so if your phone’s not lost (yet!) – check those details! Android Lost is a bit more complicated than Manager because you need to install it on your phone and then activate it by sending it a text message, which can be done from any phone. Even if you’ve already lost your phone you can install this remotely. This is awesome – unless your thief has already disabled your Internet connection. But if they haven’t cottoned on to you yet, this is when things can get interesting. The only negative thing about Android Lost is that it could potentially warn the thief that stole your Android device that you’re downloading its information remotely. For devices that are running Android 2.0-2.3, Plan B is a good tool for tracking it down. It can be installed from the Play Store and will send your device’s location to your Gmail address. The Google Maps Location History tool can track your stolen or lost smartphone – even if it’s turned off! Once again, your device has to be connected with your Google account, and have access to the Internet. One hitch: Location Reporting and Location History need to be activated through the Google Settings app on your Android. Unlike Manager, Google Maps Location History doesn’t focus on tracking down your Android device, it allows you to use your location data to look up past travel routes which will give you an indication where you might have lost it. Even if your phone is dead, Google may have saved its current location so you might be able to track it yourself by using the last reported place in your Location History. The best part of having access to your Location History is that it tracks your location frequently over a period of time – so if you’ve been tracking your thief’s movements, you can determine their most visited places, which could be their home or workplace. This will help you assist the police in catching them. To use Samsung’s Find My Mobile you have to set up a Samsung account and register your smartphone with it. Then, you’ll need to set it up on your Samsung phone by enabling remote controls. After that, sign into the Find My Mobile website and select ‘Locate My Device’ in the sidebar and voila!, you’re good to go! If your device is online, you’ll be able to see its location immediately. Find My Mobile also allows you to play other tricks like locking the device, letting it ring over and over again (annoying) and wiping its data. Apple’s Find My iPhone is a free app that can help you locate your lost Apple device, whether it’s your iPhone, iPad, iPod, or Mac. You log in once using your Apple ID and then it’s good to go. It can assist you in locating a lost device, play sounds to help you find it, and even remotely erase your personal data from your device. This tool is simple to use and you can access it via a computer’s web browser or a friend’s Apple device. Find My iPhone is great for when you’ve ‘misplaced’ your device during your daily routine and can’t seem to find it no matter where you look. Find my iPhone lets your iPhone send out a locator beacon, you then check the Find My iPhone map and can hone in on that phone lost down the back seat or hidden under the rug by a tricksy toddler. But, what’s the worst that can happen? If you’re feeling pretty relaxed about having lost your phone, it’s time to start freaking out. Want some stats? And while you may think, “hey I can just buy another phone”, you might not understand just how much losing your smartphone will cost you in the long run. These days everyone connects to their banks via their smartphones. It’s convenient and easy, and banks push their clients to use mobile banking sites as it’s easier and more convenient for them, too. Most of us check our balances and recent transactions, while others pay bills and transfer money to and from accounts. It doesn’t seem like a big deal, but each of these activities requires you to enter, send and store financial date on your phone, making it a big risk when it’s been lost or stolen. People in the know don’t do their online banking on their phones because they understand the risks involved. If you’re determined to play with your money via mobile, you should have a device password, especially if you have automatic sign-in for your banking and financial websites. If a thief has access to your bank account they can do a lot of damage by changing billing addresses, transferring your money from your account to theirs, or by buying merchandise and charging it your accounts. Both Android and Apple iOS allow you to have a passcode – not just a pin code – in order to access your device. We all know that using and remembering multitudes of usernames and passwords is a challenge, but using a password manager on your smartphone is a big risk. It makes sense to keep all of that important information together, but when your phone gets stolen, a clever hacker will be on cloud nine with access to all that data stored in there. You’re potentially granting access to any accounts you have set to automatically log into on your phone – your fitness apps, emails, social media, calendars – anything! Write your passwords down in a book at home, and keep them in a safe place. Now that you’ve been somewhat traumatised with the pitfalls associated with losing your smartphone, how about we let off some steam by looking at some crazy stories of lost and stolen phones. At the pub: Once upon a time a certain Apple engineer left his iPhone G4 prototype at his local pub. A very clever punter saw it and sold it on to Gizmodo, where they were able to blog about the new features before Apple could launch it! In a taxi: Taxis are great places to lose a phone, and to gather evidence in a criminal case! Phones found in taxis have been used in multiple criminal cases all over the world. Often criminals leave a trail of incriminating text messages that help police put them behind bars for a long time. They also help pin-point locations which can put perpetrators in specific places which police can then refer to when they’re creating the time-frame of a crime. In an animal: A guy in England lost his phone on the beach while he was playing with his dog. A week later someone called his girlfriend from his number! Apparently someone had caught a fish and when they went to gut it, they found a phone inside its stomach. He retrieved the SIM card, inserted it into a dry phone, and found the saved contacts. Are you worried about losing your phone but don’t have the time or need assistance with installing the right apps? We can help you out by advising you on what programs you can set up on your phone to reduce the risks associated with the possibility of future theft. Get in touch with our experts today!